Description: After Francis Gary Powers was shot down over the Soviet Union during a CIA spy flight on 1 May 1960, NASA issued a press release with a cover story about a U-2 conducting weather research that may have strayed off course after the pilot "reported difficulties with his oxygen equipment." 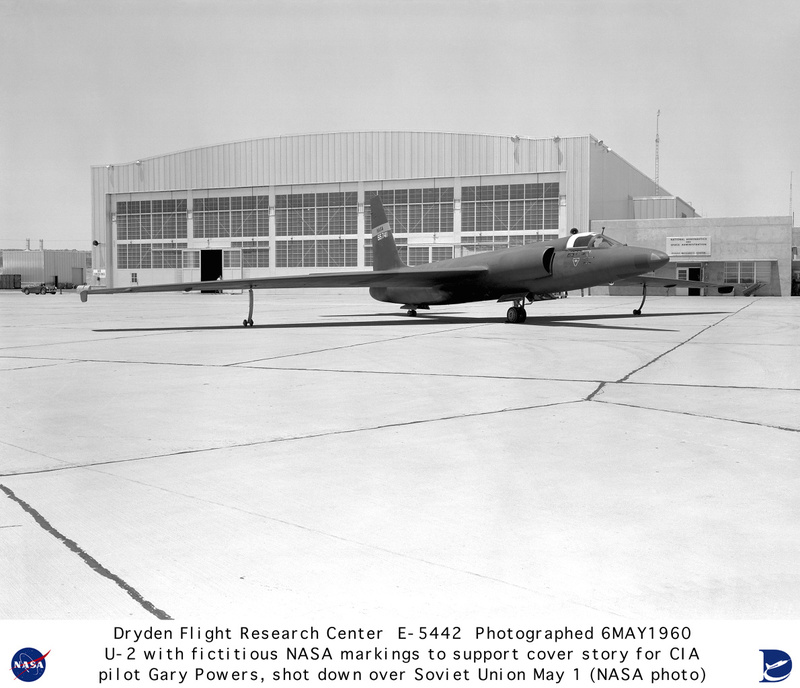 To bolster the cover-up, a U-2 was quickly painted in NASA markings, with a fictitious NASA serial number, and put on display for the news media at the NASA Flight Research Center at Edwards Air Force Base on 6 May 1960. The next day, Soviet Premier Nikita Kruschev exposed the cover-up by revealing that the pilot had been captured, and espionage equipment had been recovered from the wreckage. - NACA Director Dr. Hugh L. Dryden issues a press release stating that U-2 aircraft are conducting weather research for NACA with Air Force support from Watertown, Nevada. - A second press release is issued with cover story for U-2 aircraft operating overseas. - Francis Gary Powers is shot down near Sverdlovsk. - U-2 with fictitious NASA serial number and NASA markings is shown to news media to bolster cover story of NASA weather research flights with U-2. - Soviet Premier Kruschev announces capture and confession of Powers. - Dr. Hugh L. Dryden tells senate committee that some 200 U-2 flights carrying NASA weather instrumentation have taken place since 1956. - NASA receives two U-2C aircraft for high-altitude research. These were the first U-2s to actually be operated by the NACA or NASA, as opposed to the CIA or U.S. Air Force.